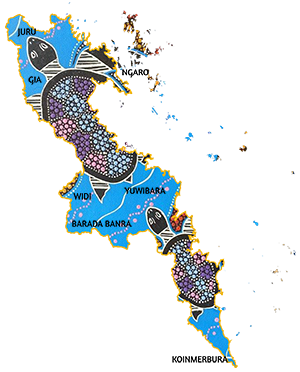 The Traditional Owner Reference Group (TORG) is made up of representatives from Yuwibara, Koinmerburra, Barada Barna, Wiri, Ngaro, and Gia and Juru within the boundaries of the Reef Catchments Mackay Whitsunday Isaac (MWI) region. The group plays a role in supporting Indigenous people and organisations to participate in the delivery of NRM activities. The group regularly convenes meetings to provide an opportunity to work together with stakeholders and the broader community to improve knowledge of cultural heritage values and NRM issues within the region. Importantly, the group provides guidance on what projects they feel are important for funding. Their involvement is producing real outcomes for the benefit of their lands and the wider community. The TORG aims to make the MWI region a proactive leader in cultural heritage and environmental management, recently releasing the MWI TORG Strategic Plan 2017 – 2027. I am a Traditional Custodian of our Yuwi Lands (Yuwibara descendant). Our connection is through our Great Grandmother Molly Bargo Tonga. Our boundary is from Midge Point to Cape Palmerston and 10 nautical miles off shore. Our people are very passionate about preserving our land and sea for future generations. Myself and my sister, Veronica Ah-Wang, are involved with the TORG (Traditional Owner Reference Group) and we work with Reef Catchments. Last year we were involved with Healthy Rivers to Reef report card and the launch to the Mackay Community and partnerships. I am a custodian for our Yuwi land (Yuwibara descendant). Our people are very passionate about preserving our land and sea for future generations. Myself and my brother George Tonga are involved with the Traditional Owner Reference Group (TORG) and we work with Reef Catchments. I am also a mentor/elder in the Mackay Murri Court system. We also deliver cultural awareness to Justice Groups. George and my connection to Yuwi land is through our great grandmother Molly Bargo Tonga. Our boundary goes from Midge Point to Cape Palmerston. I have been an active member of Reef Catchments Traditional Owner Reference Group (TORG) for over ten years and am passionate about sharing my skills and knowledge with fellow Traditional Owner groups to look after our culturally significant sites and culture. My involvement with the Traditional Owner Reference Group (TORG) has been from the beginning, when I worked for Queensland Parks and Wildlife Services. I have learnt a lot from the other Traditional Owners within this group. Our job is to look after country and the best way to do this is to work together. We share and learn culture. I am a direct living descendant of the Ngaro people that inhabited the Whitsunday Island and am one of the voices on the spiritual connect that is a link between us and our ancestors. I have been involved in the listening post that is erected on Hook Island, have taken an active role in works with the Environmental Protection Agency and am an active member of Reef Catchments Traditional Owner Reference Group. I am a mentor to the young ones and am involved in anything and everything regarding my county. I am a direct descendant of the Juru peoples of Bowen. I have been involved as a Juru elder with the TORG for four years. I am privileged to share my knowledge. My connection is also with the Ngaro and Gia peoples of the Whitsundays. I am involved with the schools in Proserpine, Whitsundays, Airlie Beach, and Bowen in which I share my knowledge and participate in all activities/events involving the Traditional Owners. My vision is to teach the young and to hand down my knowledge so that they can appreciate and respect the ways of our Ancestors of the Juru people. I am a direct descendant of the Gia people, with connection to the Juru and Ngaro peoples on my father’s side. My mother’s side, I have bloodline connection to both the Juru (Bowen, NQ) and Kunggandji peoples (Yarrabah, NQ). My involvement is only recent with the Traditional Owner Reference Group, though I am very passionate to learn as much about my country in as far as protecting and preserving our traditional customs, language (where possible) and lore and enhancing my knowledge of cultural sites and boundaries that our ancestors respected and valued. Our future generation, who will one day be our ‘future elders’, will be able to hand this knowledge down to their children so that our history will remain with us. My name is Samuel Dallachy and I am a descendant of the Barada/Wiri tribes. I am a senior Cultural Heritage officer which gives me a voice for our group and how our cultural sites are managed and looked after. The TORG is a great opportunity to be involved in the implementation and management of our cultural and environmental resources. The MWI TORG Strategic Plan 2017 – 2027 presents a high-level document for the direction, aims, and goals of the MWI TORG as it develops from an advisory body within Reef Catchments Limited to a more active agency in the region. The strategic plan will be used by the MWI TORG to seek support from its partners to deliver cultural heritage environmental management programs and community communication and education programs as an established not for profit entity, thus assisting the group’s aspiration to make the MWI region a leader in proactive cultural heritage and environmental management. Download the MWI TORG Strategic Plan 2017 – 2027. If you would like to learn more about the MWI TORG and its future direction, please contact Katrina.